His guitars have been played by Joe Satriani and Kenny Wayne Shepherd. And he counts Sammy Hagar, Eric Bloom and Blue Oyster Cult's Buck Dharma among his clients. He's JC Harper. Like many people who start their own business, it was adversity which finally pushed Jon C Harper into building guitars. 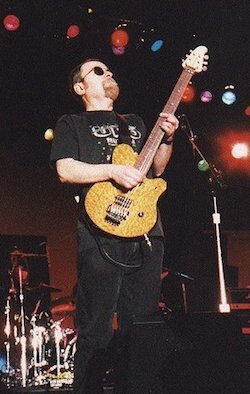 Not many luthiers can say, hand on heart that they were completely happy with there first build, but Harper's first guitar, the Monterey, has been played by Eric Bloom (pictured), Joe Satriani, and Kenny Wayne Shepherd. 'It was kind of a Teleish/EVH design but with a smaller body. Basswood, Lacewood bookmatched top, maple neck with purple heart fingerboard, Gotoh Floyd rose, 2 DiMarzio humbuckers and just a volume control and three way toggle – was really into Van Halen at the time so that influenced my early builds,' Harper told us. As ever when we talk to luthiers, Jon Harper's advice is both excellent, and generous. And, as you can see from the pictures, his guitars look every bit as good as they sound.